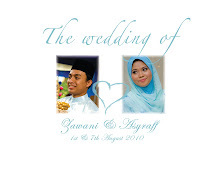 Then, I realize, wedding is not just a day story. Wedding is nothing. The marriage is the most important. I take marriage so seriously that I put lots of thoughts about to say "I do" to him. Well, now I did, and trust me that is the most righteous decision I have ever made. Allah guided me well. He knows well about my fragile heart that he didn't let me waste my time with other man. My husband is my first love and I promised he will be forever. Kebahagiaan bina masjid yang satu ini I sudah rasakan (and hopefully the feelings stay forever). One of my ambition in life is to invest part of my harta untuk membina masjid/surau. I admit I am not a good person to Allah and to other human being. Traits or shaitan...well, most of the times the khilafs came from myself. 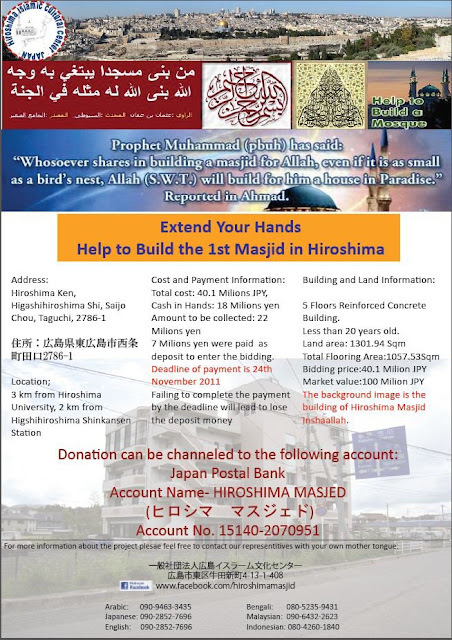 So, here I would love to invite (or plead) to my dear readers untuk sama-sama kita membantu dalam projek membina masjid pertama di Hiroshima city. In this city, there are about 1000 muslims (from recent report I read dated this year). And it is believe, this number will be expanded in years to come. But I don't want to grab all this chance alone. Bayangkan how proud you of yourself when you know its your money which helped built a mosque? Please, for the love of Allah and yourselves, help us and eventually the whole muslim nation. wani..kalau kita nak buat sumbangan kita hanya perlu masukkan duit dlm akaun hafiz tu yer?perlu bg tau braper jumlah n bila kita masukkan ker?